With Trophy support coming to PlayStation 3 games like PixelJunk Eden any day now, we wouldn't be surprised to see them leak prior to official release. 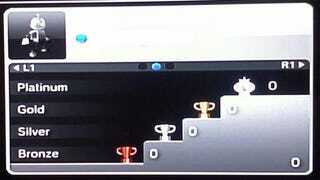 And they may have, if alleged spy shots of Trophies in action via PS3 Fanboy are the real deal. PS3 "Trophies" On Their Way? While the off-screen snaps are suspect, if bona fide they could point to an interesting feature set that adds tiers to Sony's take on Achievements as well as a leveling system. The system may be analogous to Gamescore, as far as points whoring is concerned, but could add an extra layer of showing off one's e-accomplishments. Consider it rumor for now, but we have a sneaking suspicion that we're looking at the genuine article, despite the surprise early look.